The struggle is real. More real for young athletes. These young Titans of the game want to excel. But the double edge sword is that the cost can be high. Think about your normal work day. It can be grueling but we’re adults and we know how to regulate the demands of ‘life’ and all that it throws at us. Take that same schedule and insert a Junior athlete;replace work with school,then going to[insert ANY sport here] practice. Come home. Eat. Do home work. Rinse. Wash. Repeat. It can be grueling for ANY Junior athlete. 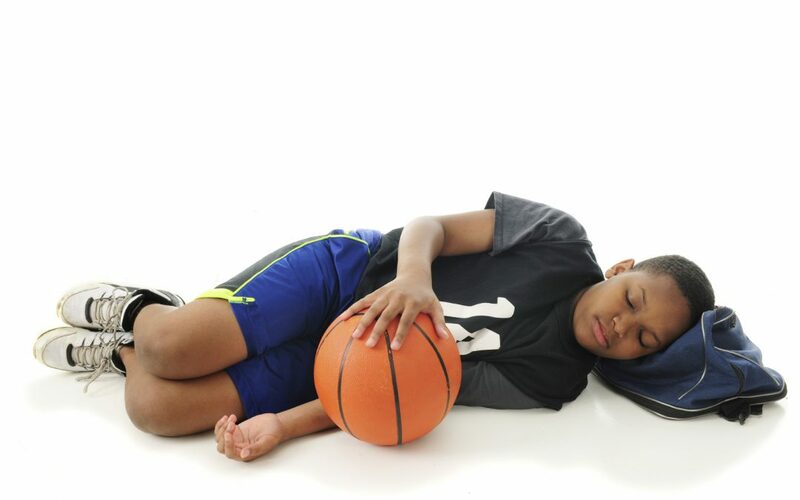 poor sleep, decreased appetite, muscle soreness lasting longer than normal, decline in academic performance that can lead to injury, and eating disorders are the most common symptoms. But the most common of these is loss of sleep. I had an interesting discussion with Dr. Kathy Derue, sleep specialist and Dr. Tifaney Braely MD,MS neurologist/sleep specialist from University of Michigan hospital and they both agreed that one of the most underrated health issues among athletes is the impact of poor sleep hygiene. Parents miss these cues because they think it’s just ‘laziness’ or they are not practicing hard enough. When a parent approaches me bout their kids sudden decline in performance, I ask “are they sleeping well?” the answer is invariably,“yes”. However, upon closer examination I discover what actually is driving this poor athletic performance. It starts by me asking “Hey,(athletes name) are you sleeping well? Your training/volume has increased”. ATHLETE: “Oh. I do, but i go back to sleep.”…. ME:”Uhhhhhh. I see. So no. You are NOT sleeping through the night and you probably feel tired when you wake for school. ME: “Warm up. Is your mom or dad here?”….. This exchange last a few moments and takes about that much time to determine that they are not getting the sleep they need. Poor sleep hygiene can contribute to symptoms of over training. ALL restoration from strenuous training and playing takes place when you are getting the proper amount of ‘zzzzzzzzz’! Parents. Athletes. Take heed. Make sure you have other activities in place to provide adequate recovery from high frequency training and practices. If the training is highly structured ie training/practice 4 times a week, and your young athlete is younger than 11, then restoration may NOT be taking place. I suggest reevaluating how much time per week is dedicated to the sport and compare that to ‘non-sport’ activities. If there is no ‘balance’, then expect your young ‘talent’ to have the potential to suffer from poor restorative practices. It easy to remedy, simply ‘reboot’ the training regimen by reducing over training factors. Those factors would be high training volumes, hectic game schedules, irregular practice times, training & conditioning sessions; to name a few. In short just make sure your kid gets to bed so they can at least get more than 8 hrs of shut eye! Also make sure there is no cell phone in the bed because the light from the screen(and all the other stuff they’re are looking at) alters sleep patterns too!